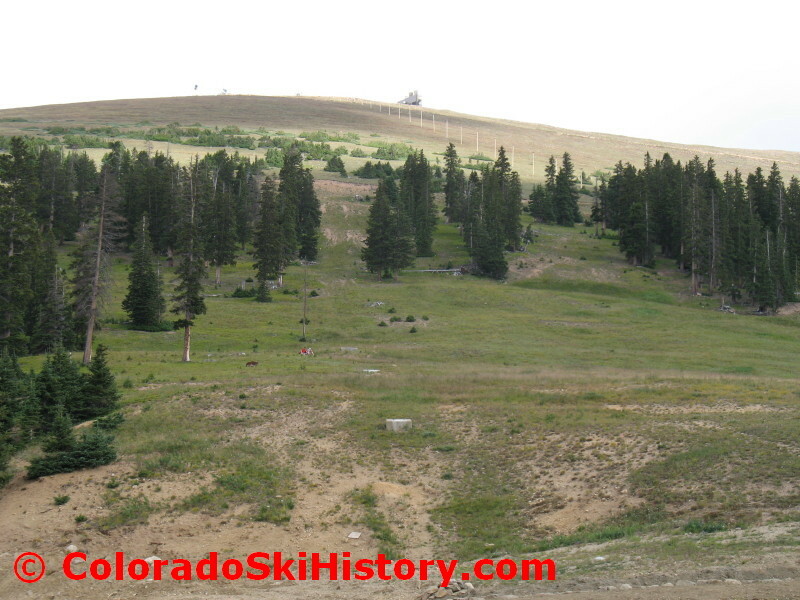 -Shuttle buses were also used to transport skiers using the pass. A special thanks to Lucy Garst and Jon Miorelli for contributing to this article. 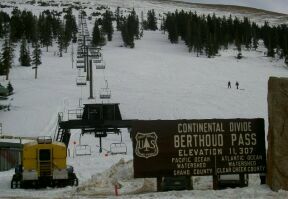 flocked to the improvised trails at Berthoud Pass. 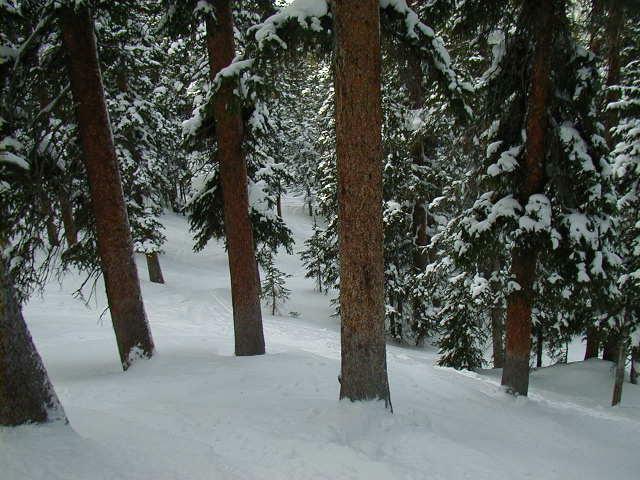 feet, the vicinity has always enjoyed abundant natural snow. 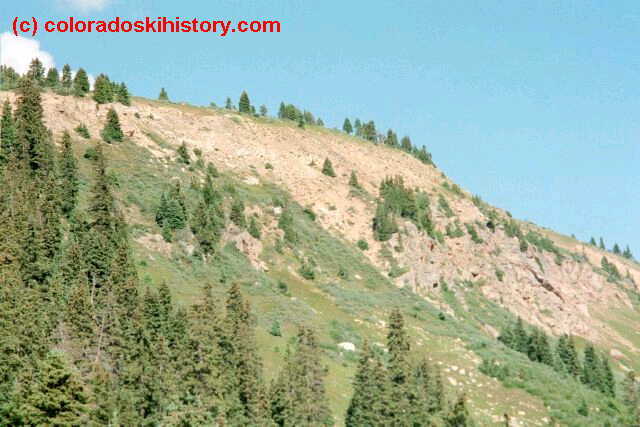 day, two German refugees did not return from skiing and search parties were organized to look for them. 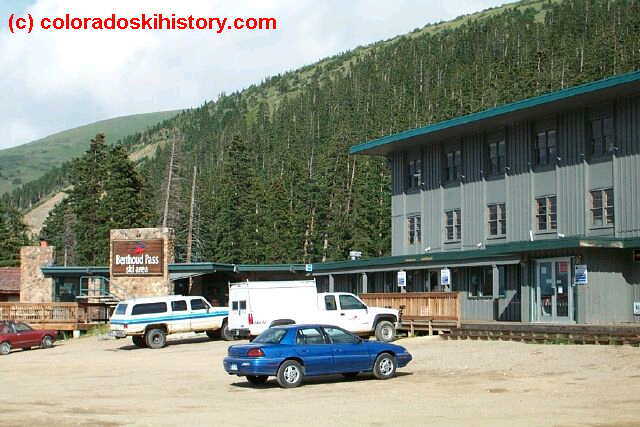 Berthoud Pass Inn. 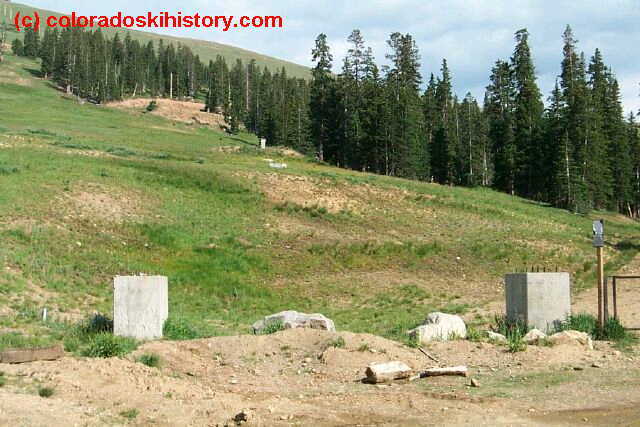 It appeared that they had been caught in an avalanche. 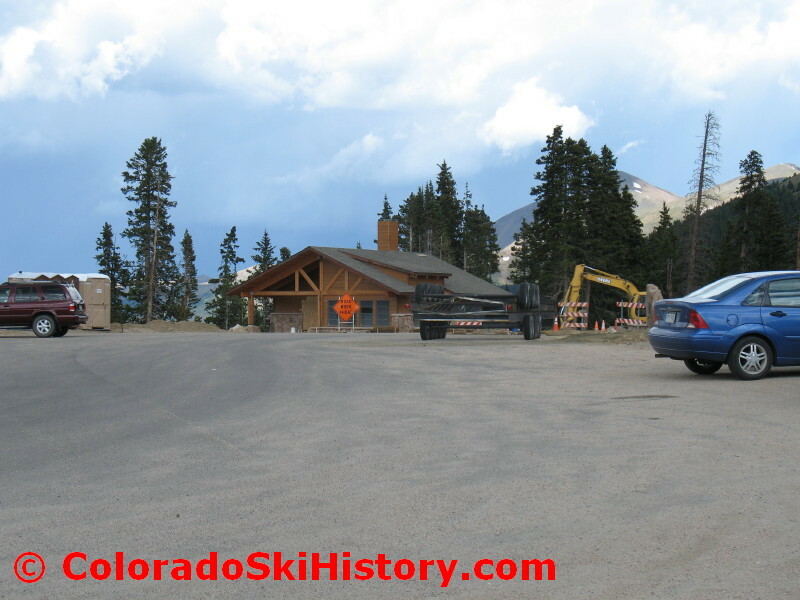 appears that lift was used for a private club, only, and not available to the public, unlike the one on Berthoud. 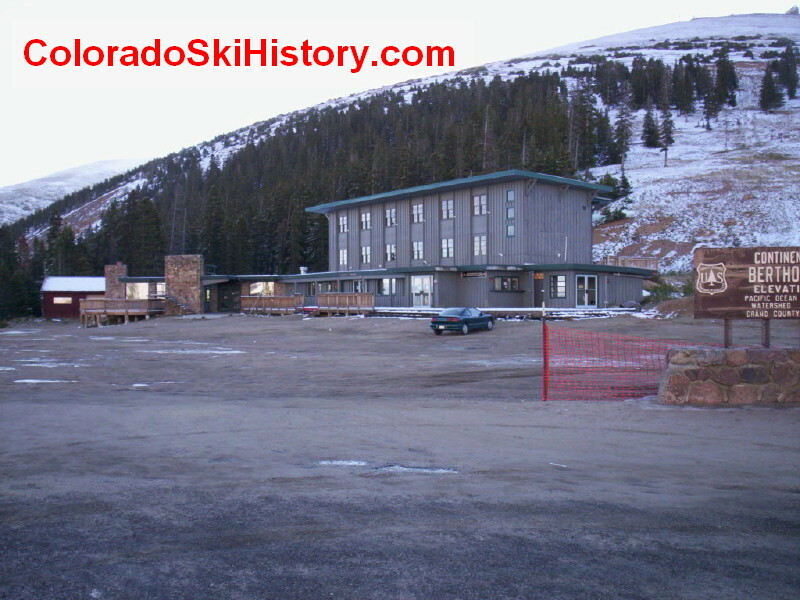 company, called Berthoud Pass Lodge, Inc., and the remaining 10% was owned by Sam Huntington. 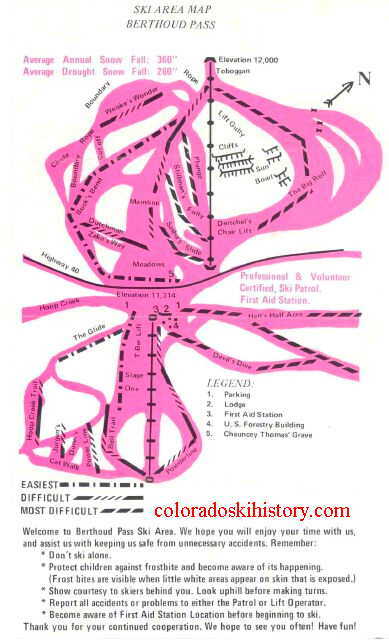 areas to Denver (57 miles), easy to reach and already very well-known. 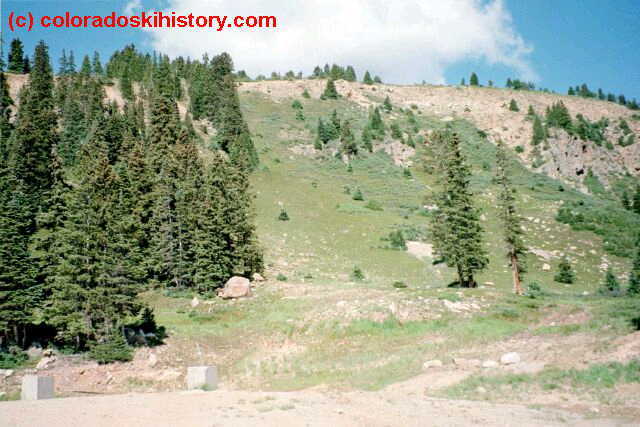 demolished by the US Forest Service in June 2005.
and had plans for the revitalization of Berthoud. 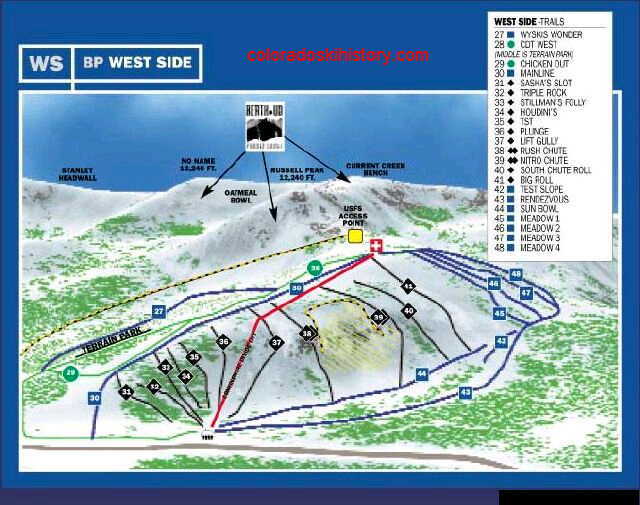 were excellent expert areas and challenged many a skier. months when the ground around the lodge had snow on it. selling lift tickets to peeling potatoes for French fries. Even Beth was at the register at the age of 7.
church groups from across the country and other not-for-profit organizations. on a smaller and less grandiose scale. and a season pass was $100.00. 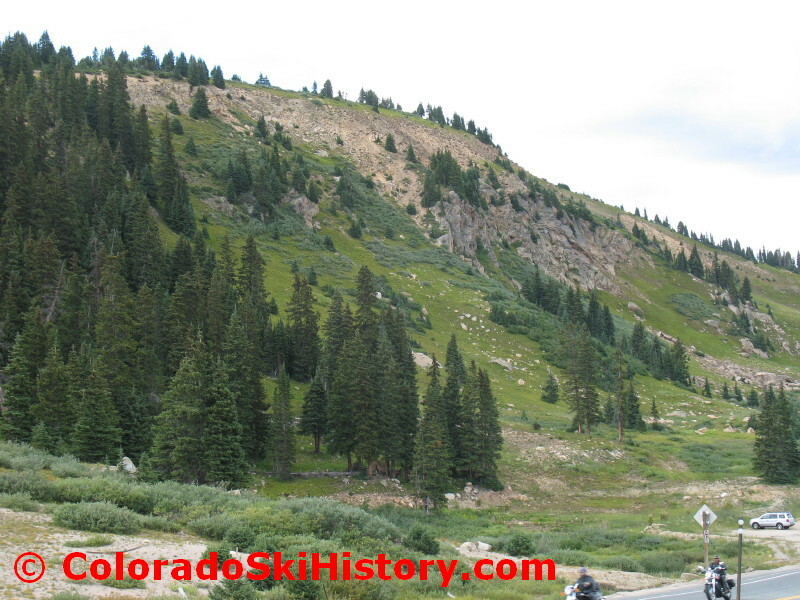 hosted the Masters and speed skiing contests. 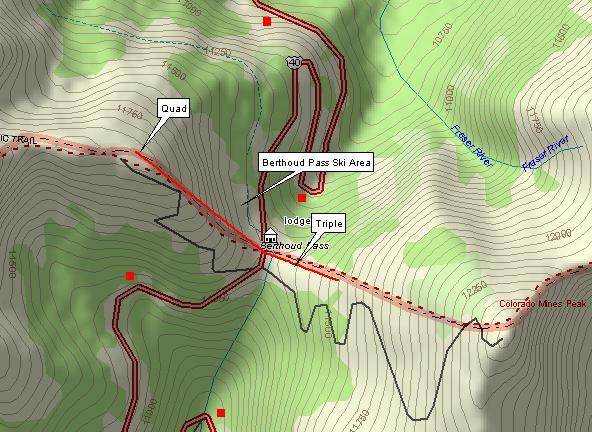 passengers who wanted to eliminate that first 700 feet of vertical on their hike along the Continental Divide. 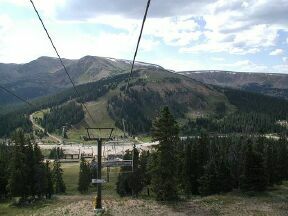 in Colorado. 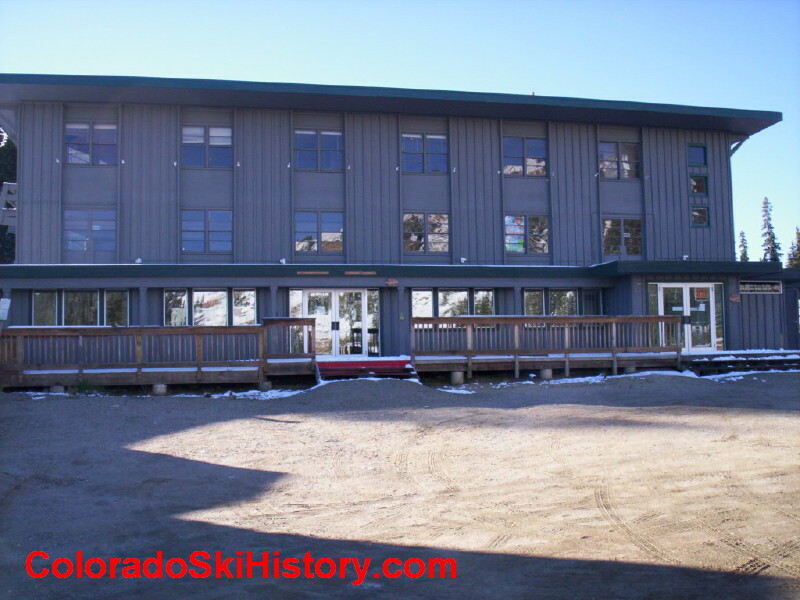 Over 150 people attended, including many ski pioneers. 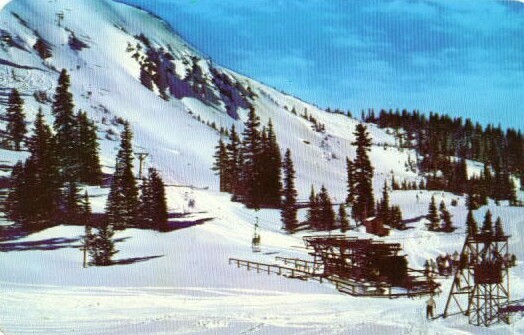 area in 1987 when their Iowa partners opted out of the ski business. 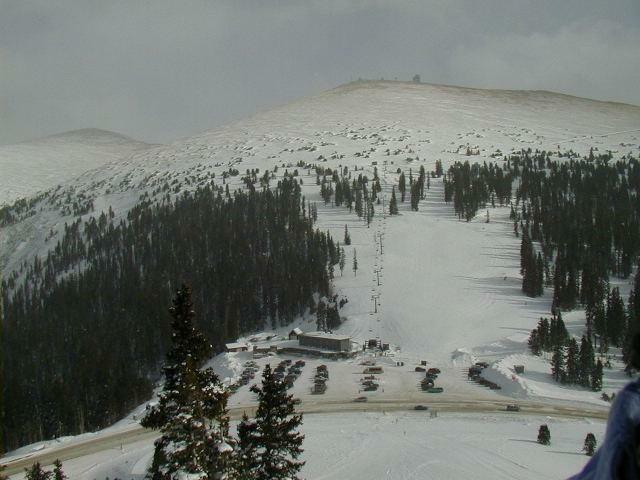 beginner’s double lift was added on the east side of the pass to entice families. 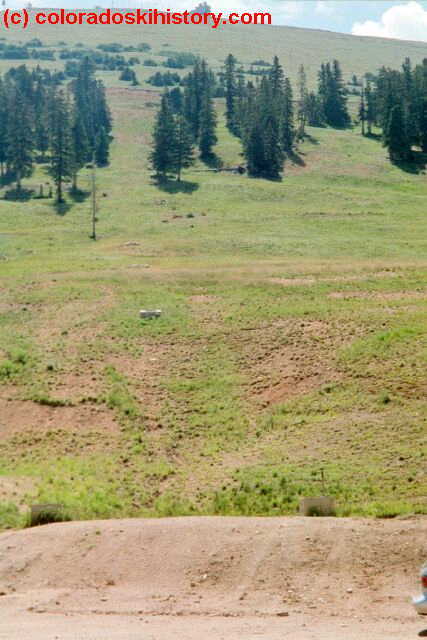 acres of terrain. 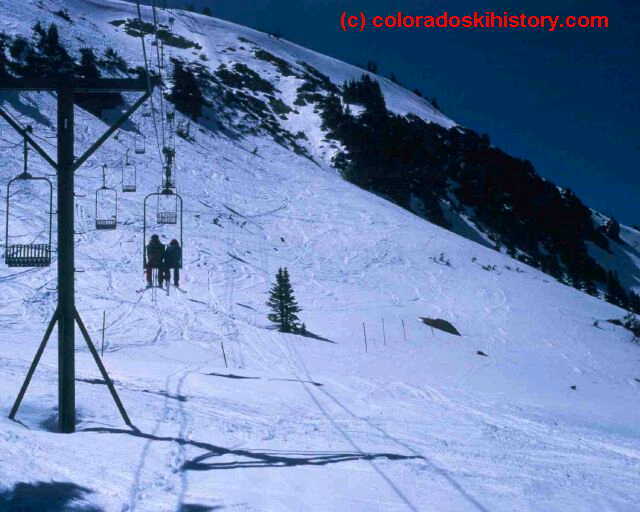 Lift tickets for the 1989-1990 season cost 17 dollars with the season ending in mid May. 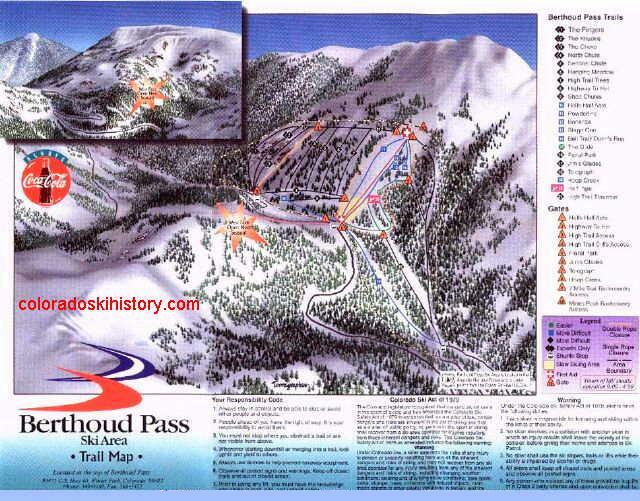 move Berthoud Pass into Chapter 7, which allows liquidation of assets. This motion was eventually granted. 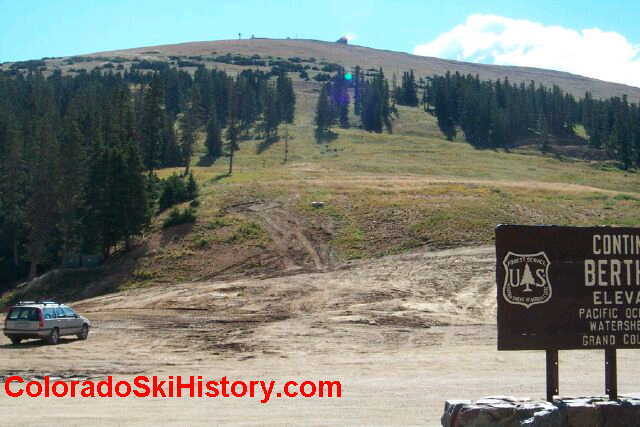 USFS. 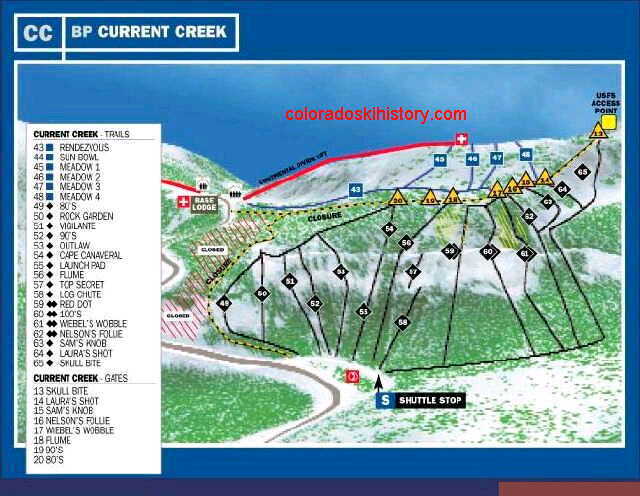 The permitting process would prove to be very difficult for Berthoud Pass over the next five years. 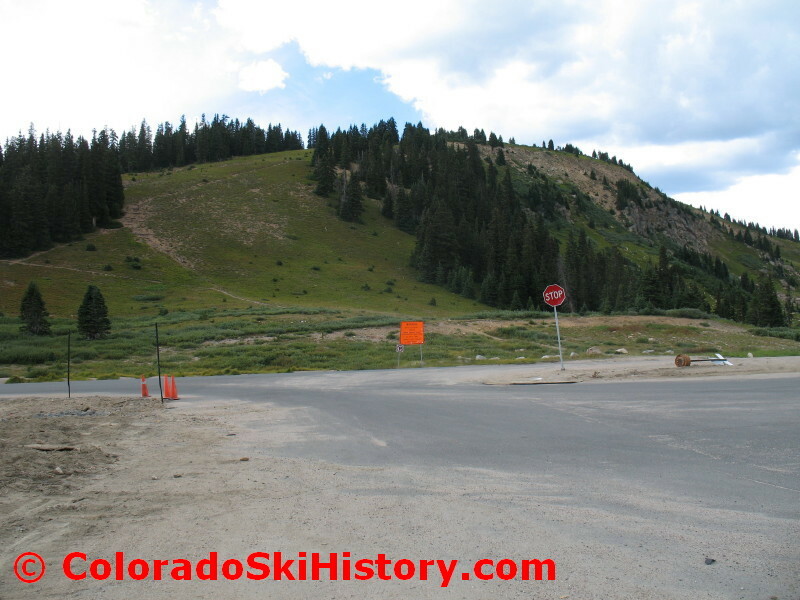 but continued to hinder the reopening of the ski area. 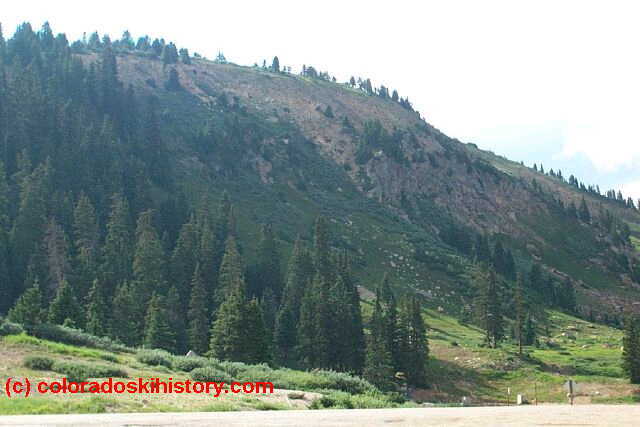 the south side of the pass only. This meant that only the triple chair could operate. 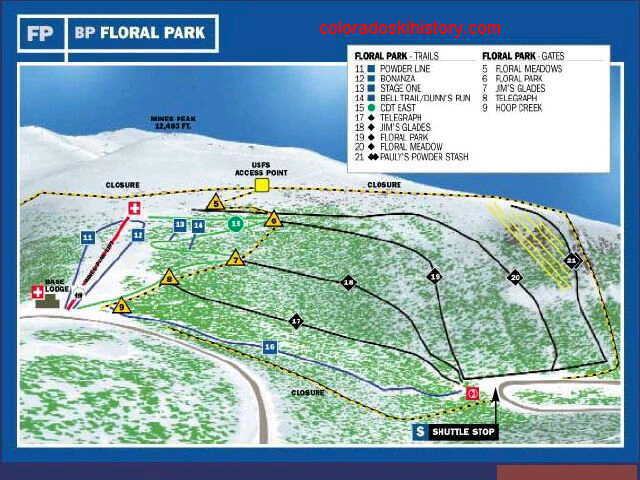 ended up at a small ski area in the mid-west. 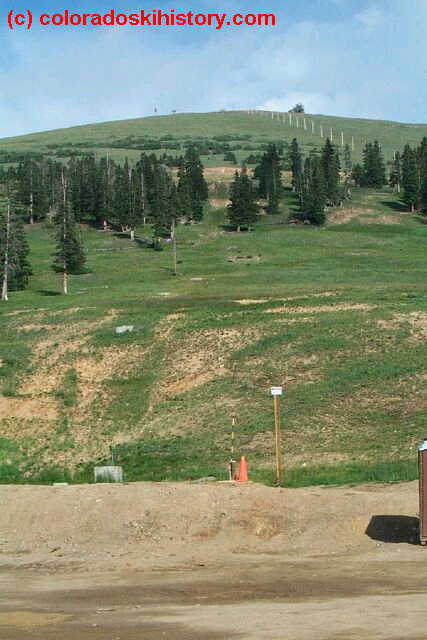 at the ski area are chairlift tower foundations and trails. 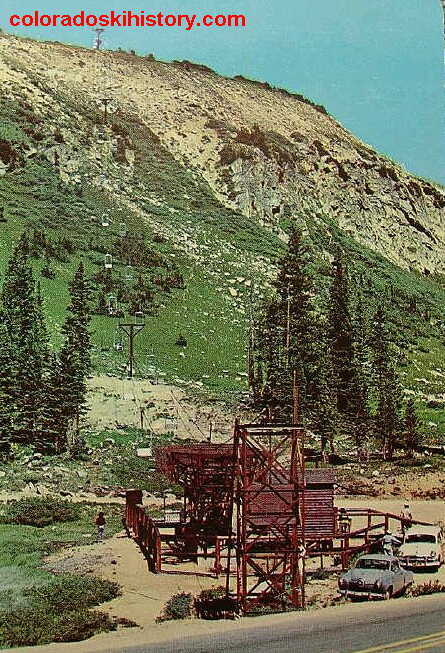 The area operated for a couple summer seasons, providing chairlift rides. 1. 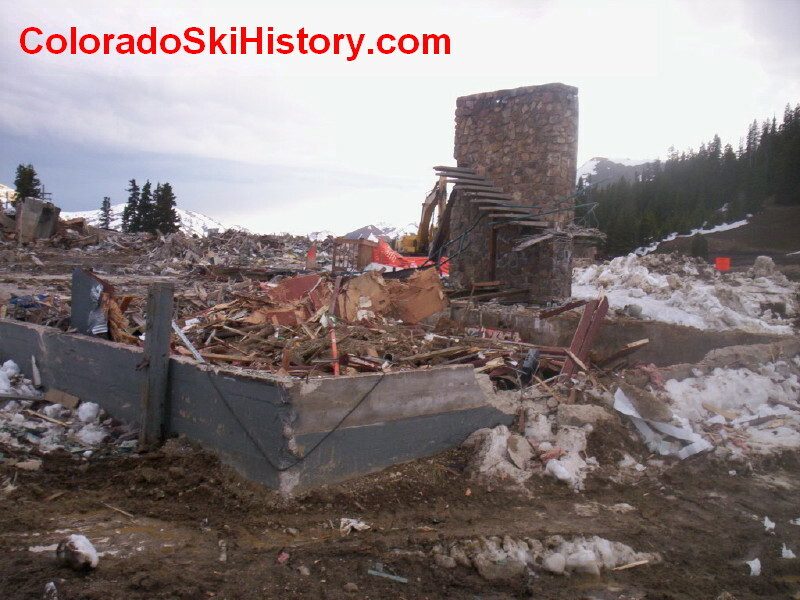 Berthoud's quad chair after the ski area's lift system closed for the last time. 2. 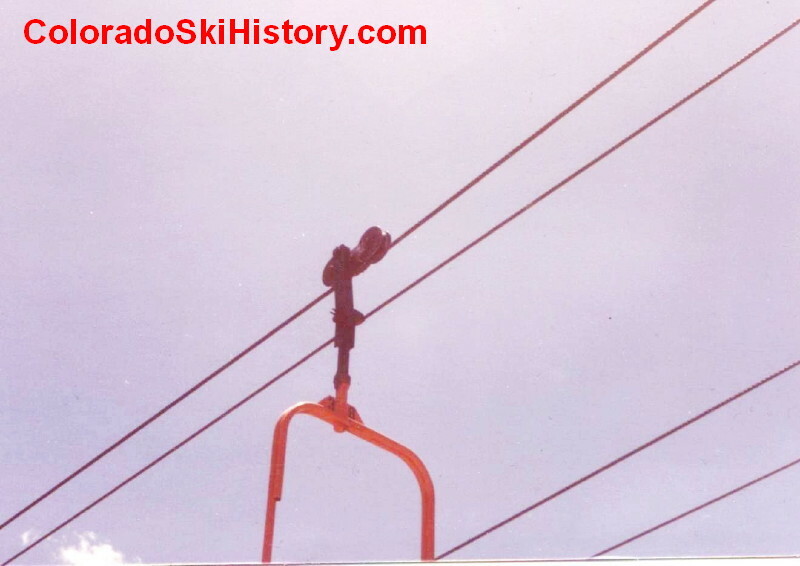 The refurbishing of the quad chair in preparation for operation during the summer of 1998. 3. 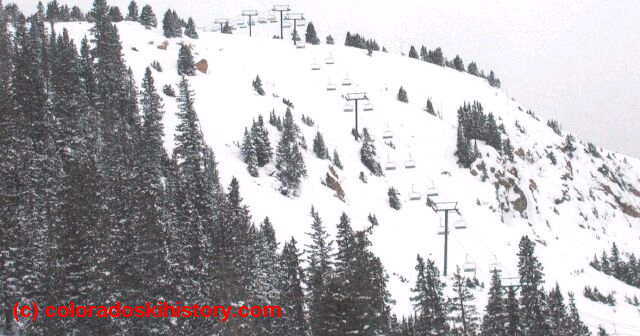 The triple chair caring skiers to fresh powder. 4. 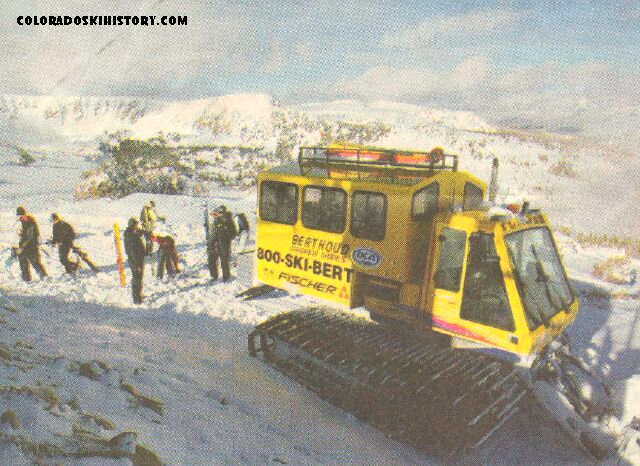 After the chairs closed in 2001, this snowcat was used to transport skiers. 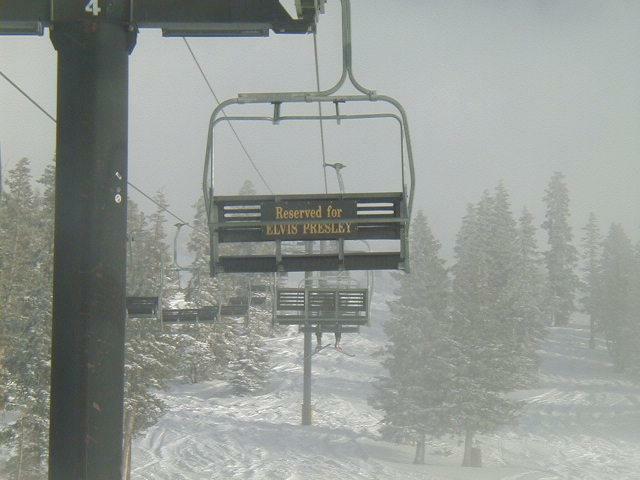 reserved for Elvis. Unfortunately, Elvis never made an appearance. 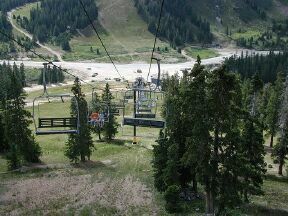 The east side of the area served by the triple chair. 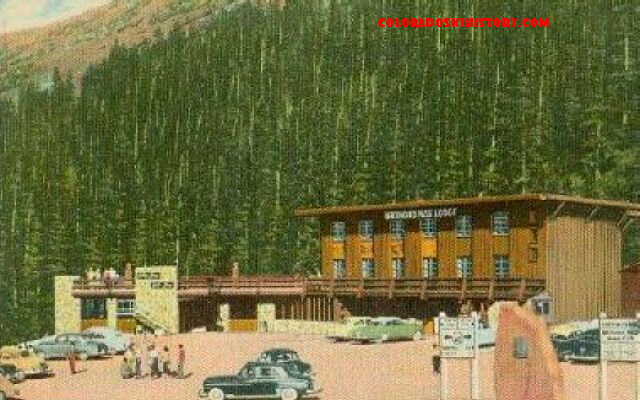 Berthoud's historic lodge was torn down in 2005 by the US Forest Service. 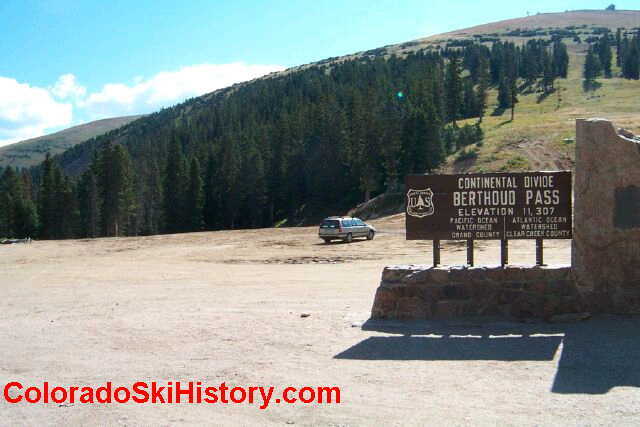 Have you ever skied at Berthoud Pass? If so, email us your memories. 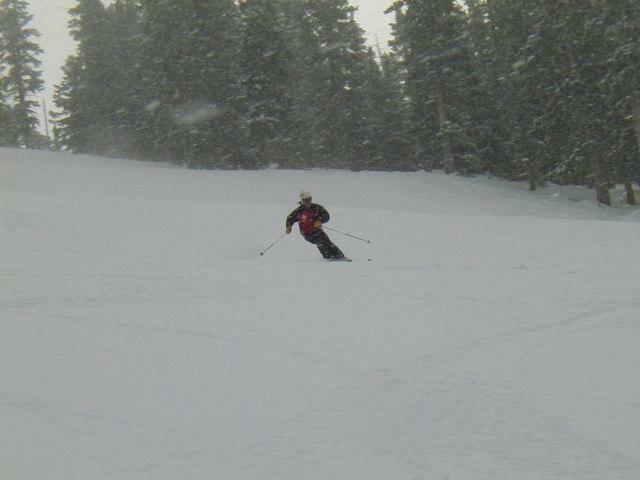 the powder days and harass Herb. and say that I wouldn't have a chance. grabbed his White Stars and of we went. 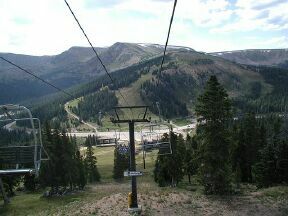 Herb took his own chair up, I followed in the next chair, it was a long silent ride to the top. day we became good pals and kept in touch through the years, until his passing a number of years ago." down through the 53 years. 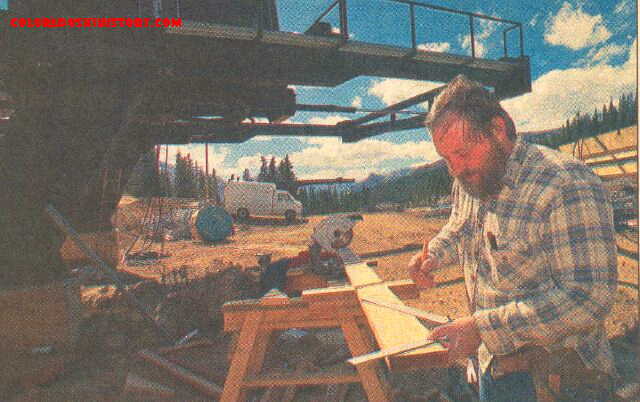 I know Sam is dead, and suppose many of the others who worked there in those days are also." 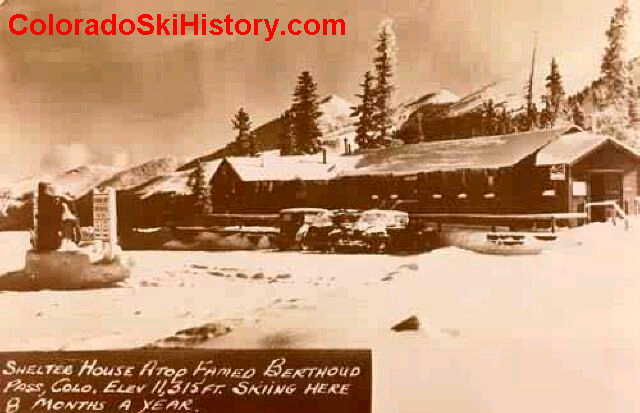 year at the Colorado School of Mines, Berthoud offered a free season pass through a local radio station contest. 20-30 minutes in the hope of being the right caller (there was NOT auto-redial then, although we did at least have a push button phone!). 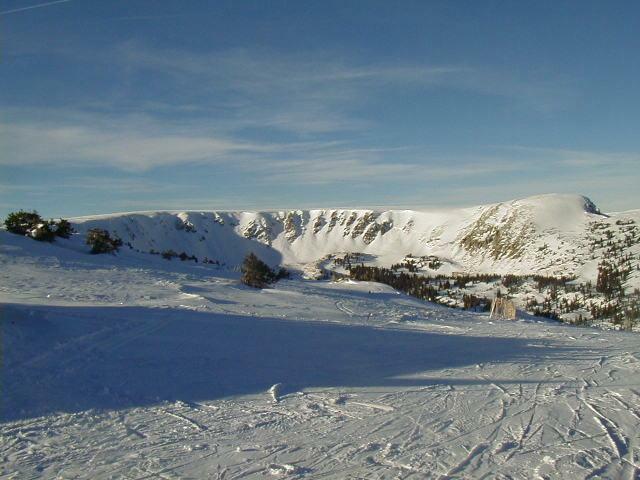 During the ski season that followed, I skied 53 days...while being enrolled in 18 semester hours of engineering school! 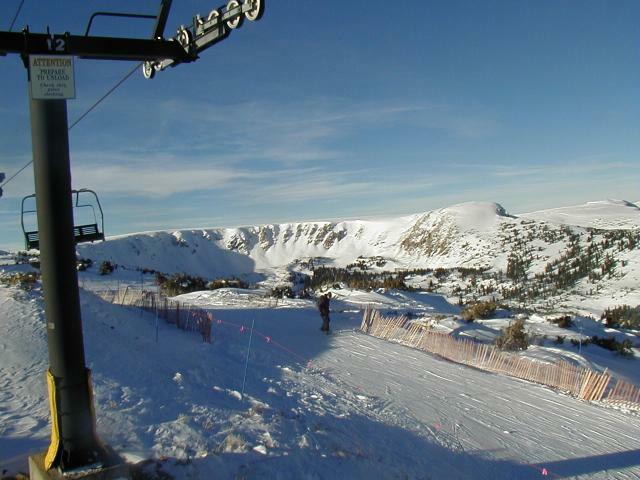 part of the reason I've lived in Utah since 1985! 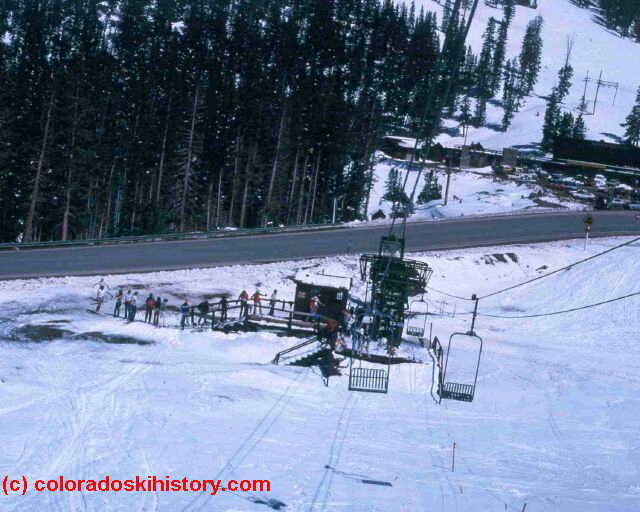 Incidentally, my story has always included that in my 53 ski days that season, only 5 of them didn't include SOME fresh snow. and graduated on schedule in 1980...whew! 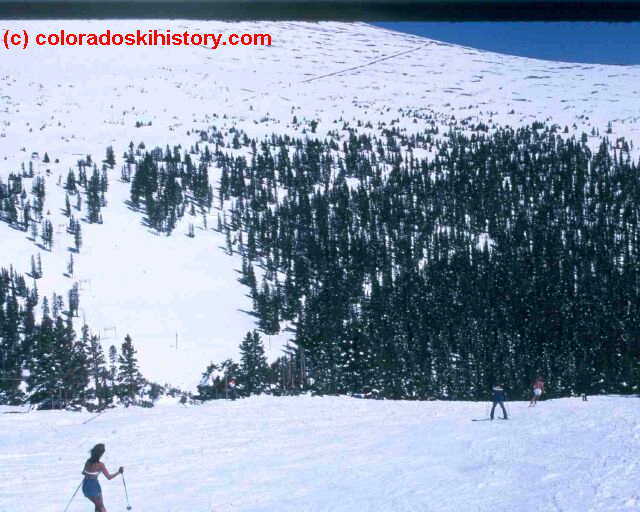 back country skiing which lasts to this day." windy. 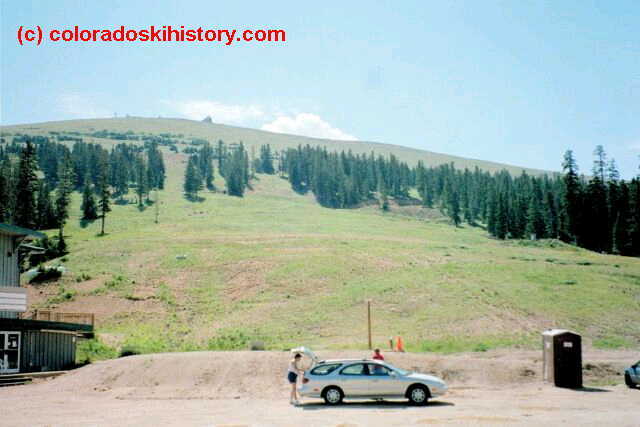 It was an experience skiing there. 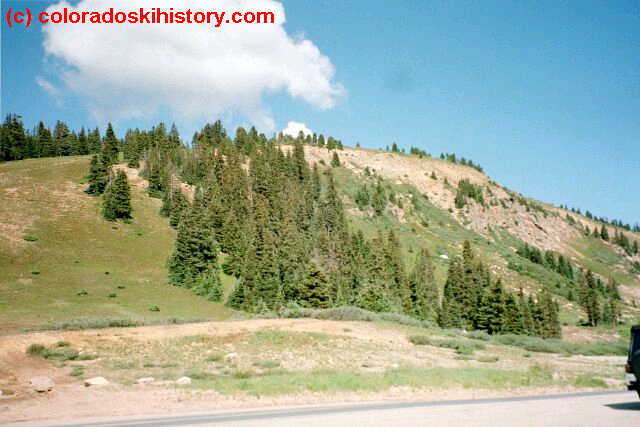 I remember steep slopes at the time." 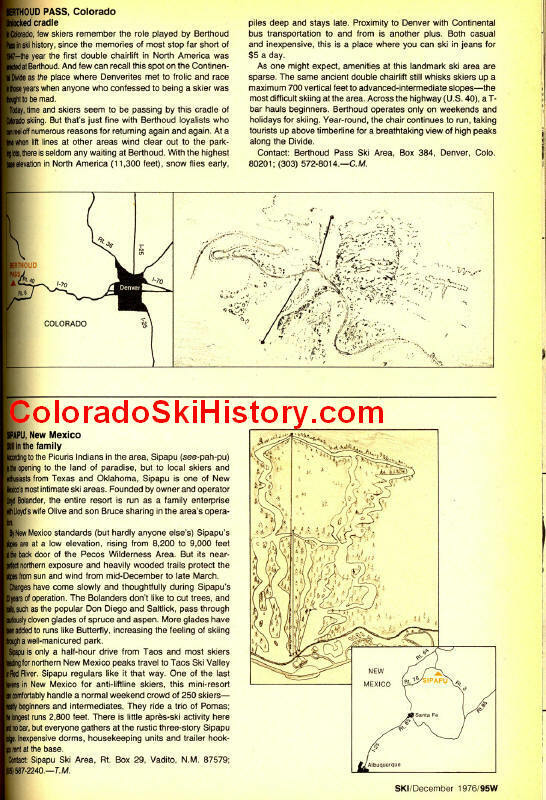 missing a weekend at the ski area during the seventies." next chair got to me. the first cut, but washed out next time, so didn't make the team." 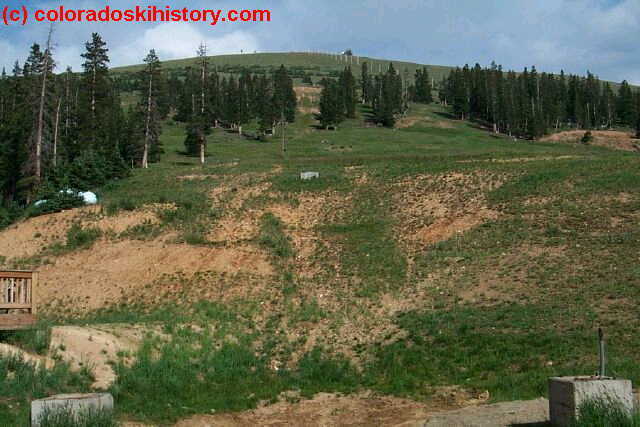 this ski area was quite popular with my friends and I." 30 on our last traverse out, and there was still more snow to ride. One of the best riding days of my life!" 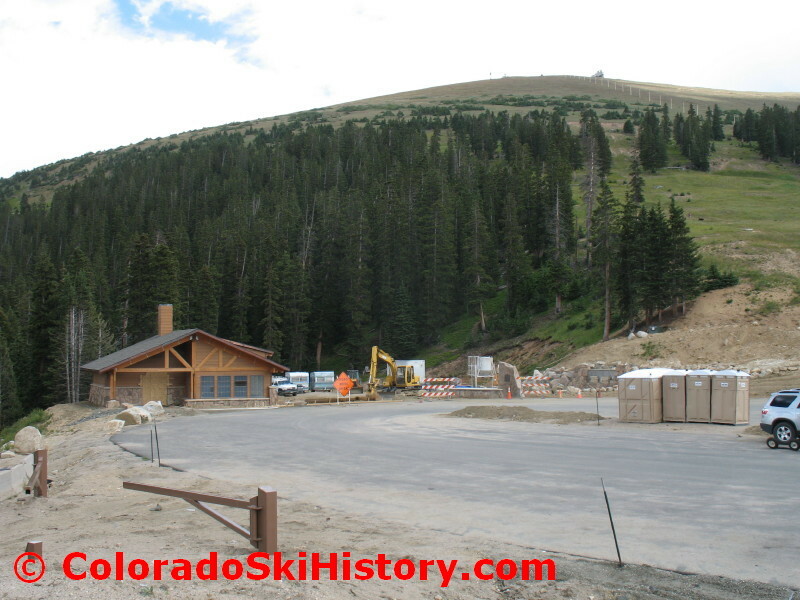 Colorado Ski Museum, $ Jonathan M.
The new USFS rest area is almost complete where the lodge once stood.